I’m so thankful to have the chance to live in an environment which allows me to try new food from all over the world. However, choices of fresh seafood are so limited here in east Tennessee…and that makes me miss my home country even more. Finding frozen cod, which is easily available here, changed my attitude toward cooking dramatically though. Just add a small amount into a soy sauce based soup to get a traditional restaurant quality flavor. I had no idea how to produce such an elegant taste before and perhaps not the right way…anyway, what I want to say is ever since I started using this high protein, low fat, vitamin-rich white fish, it has become one of the items that I always have in stock in my freezer. It’s not an exaggeration to say that I have eaten more cod in the past year than I did in my entire life in Japan. 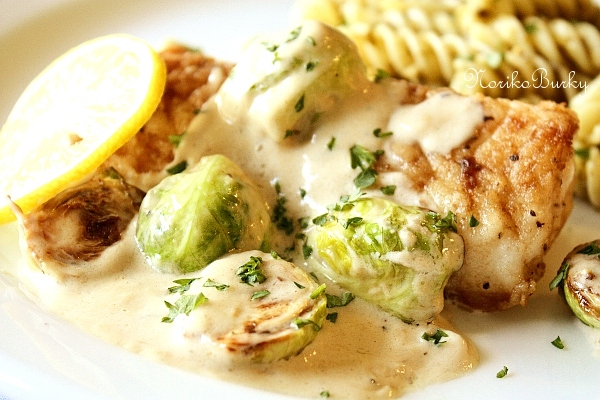 Cod goes well with so many different sauces and types of cooking because of its mild flavor. 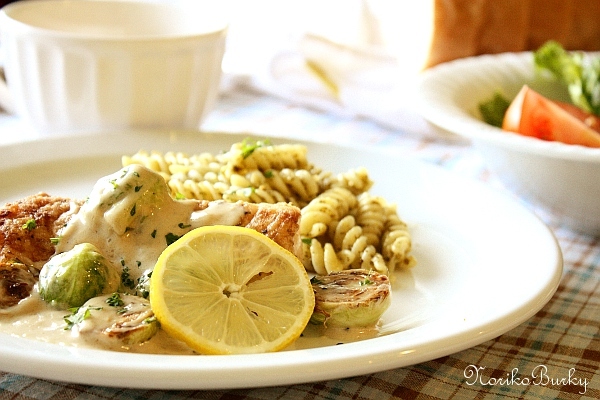 This time, I prepared it with a creamy sauce, still guilt-free because of the fish’s health benefits. Its delicate flaky texture is perfect for embracing the flavorful sauce. 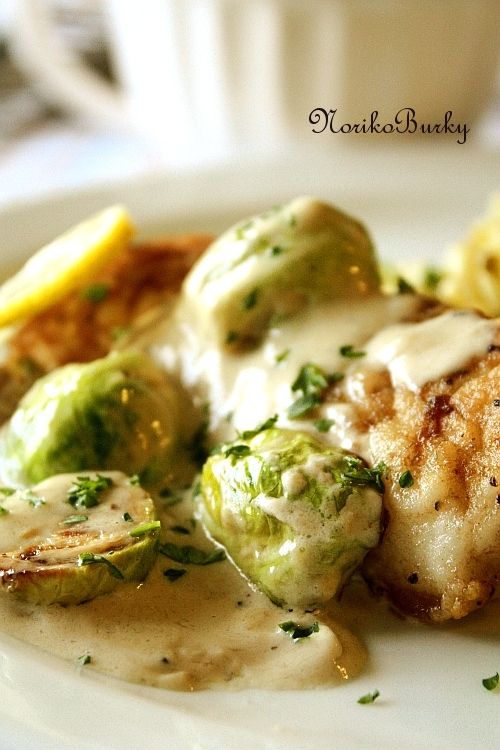 Cream sauce with tangy lemon and a hint of anchovy poured generously over flour coated then sauteed cod. Sprinkle salt and pepper on each side of cod. Coat them with all purpose flour. Microwave Brussels sprouts for 1 min. In frying pan, heat 1Tbsp olive oil and 1Tbsp butter over medium heat, cook Brussels sprouts for 2 mins. Remove from the pan. In the same pan, add 1Tbsp olive oil and 1Tbsp butter and heat over medium heat. Saute cod on one side for 1 min. then turn. Put the lid on and cook for 2 mins. Remove from the pan. Turn off the heat. In the same pan, add anchovy paste and dissolve using whisk. Add lemon juice and heavy cream. Add the Brussels sprouts then heat it over medium heat until right before it starts to bubble. 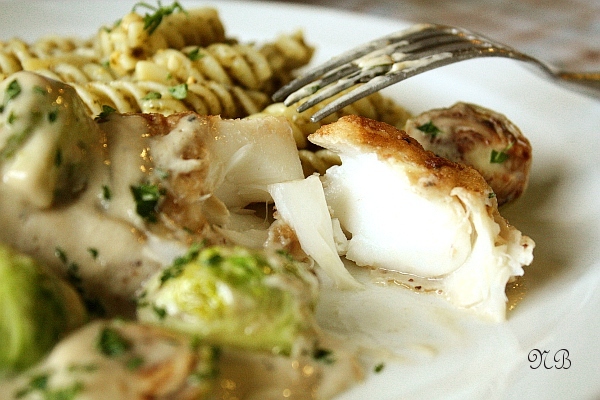 On a plate, lay the sauteed cod and pour the sauce over. Sprinkle chopped parsley if you like. Don’t you think Brussels Spouts are too pretty to be true? It’s one of the vegetables I could never imagine liking when I first ate one a long time ago, but it’s always amazed me how people’s tastes change over the years and also the ways things are cooked. So juicy and moist…love, love, love it! 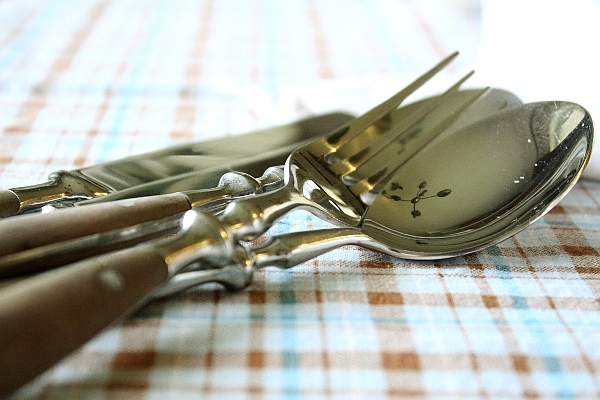 The tangy lemon makes the sauce light and the hint of anchovy gives depth to the flavor. Accompanied by fusilli coated with pesto, fresh vegetable salad and a bowl of soup.